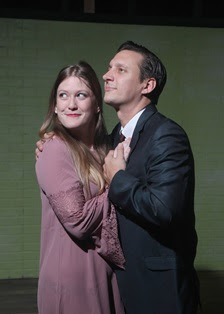 The Chatham Community Players open their 96th Season with Neil Simon’s “Barefoot in the Park”, a play that is at once a charming and romantic comedy, and a commentary on love and compatibility. This production will run from October 6 through 21. Michael Hegarty from Highland Park directs. Paul and Corie Bratter are newlyweds in every sense of the word. He’s a straight-as-an-arrow lawyer and she’s a free spirit always looking for the latest kick. Their new apartment is her most recent find – too expensive with bad plumbing and in need of a paint job. After a six-day honeymoon, they get a surprise visit from Corie’s loopy mother and decide to play matchmaker during a dinner with their neighbor-in-the-attic, Velasco, where everything that can go wrong, does. Paul just doesn’t understand Corie, as she sees it. He’s too staid, too boring, and she just wants him to be a little more spontaneous. Running “barefoot in the park” would be a start. 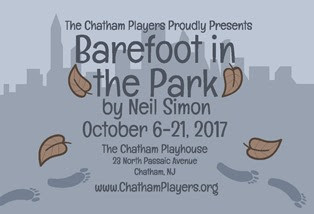 For more information, including the cast and production team, please visit ChathamPlayers.org. Please PRINT YOUR TICKETS with BARCODE. We don't scan cell phones, but we do print free duplicate tickets.